While a variety of non-invasive stretch mark treatments are available today, they may produce little results. 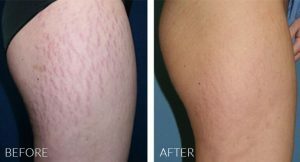 However, Microneedle is a highly promising new med spa technique that can actually heal and eliminate stretch marks up to 100%! 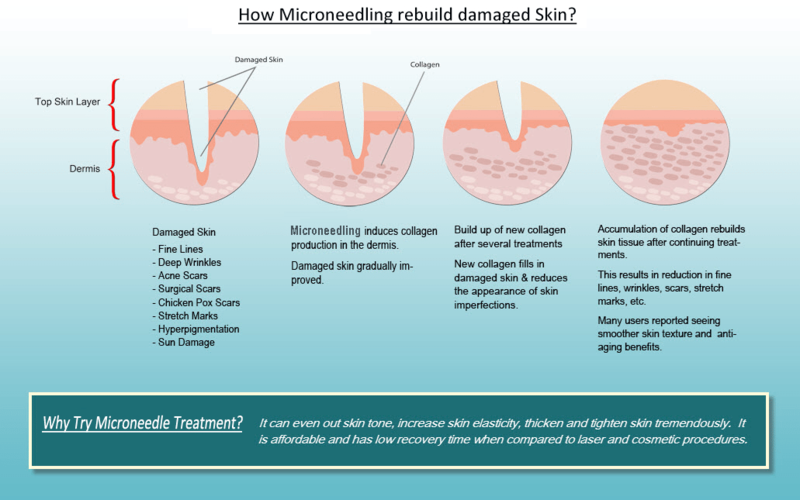 Microneedling treats stretch marks, including a wide range of skin imperfections! 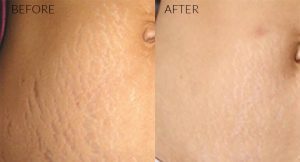 Our microneedling for stretch marks typically works for the abdomen, thighs, buttocks, and upper arms! The process of reducing stretch marks or treating stretch marks occurs as micro-needling promotes the production of new elastin and collagen fibers in the skin. The stretch marks should gradually fill in, and the skin should grow thicker, become tighter, and restore its elasticity. The speed at which stretch mark reduction can be achieved can vary depending on the severity of the stretch marks. However, visible changes may be detected in as little as a week with possible dramatic results in a month or less. The small channels in the epidermis close very quickly and the skin begins a healing response right away. Depending on the depth of the skin defect, you may see only redness or you may experience some pinpoint bleeding which stops almost immediately. While no treatment can completely eliminate or remove stretch marks, Microneedle can significantly improve the appearance of red, white, and purple stretch marks. In some cases, the stretch marks may even become difficult to see. We find that the skin rejuvenating effects of The Eraser work well on many types of scarring including stretch marks. How Many Treatments Of Microneedle Will I Need? You will begin to see results within a week following treatment with clear results appearing by four weeks. Because Microneedle causes your body to naturally produce collagen to heal itself over time, you may continue to see improvement for up to a year. Yes, proprietary combination of micro-needling and PRP or Vitamins allows the skin to produce collagen and healing effects from below. New tissue will be created so that even old blemishes and scars like stretch marks are improved. Is It Appropriate For My Dark Skin? MIcroneedle treatments are safe and effective for all skin tones and types! In fact, there is less likelihood of post-inflammatory hyperpigmentation. The depth of the needling during the treatment is adjusted based on the severity of your stretch marks. For treatments with shorter needles, only a slight sensation will be felt – similar to a tickle. When longer needles are required, a numbing cream is applied to minimize discomfort.